The Weihrauch HW100 Thumbhole is the German manufacturer's first pre-charge rifle. This rifle has established itself as a market leader, and is fast becoming a favourite with hunters and FT shooters alike. With Weihrauch legendary build quality and supreme accuracy as standard. It's place in the top tier of air rifles is easily understood. This model is yet another evolution in design and performance from this top German manufacturer. 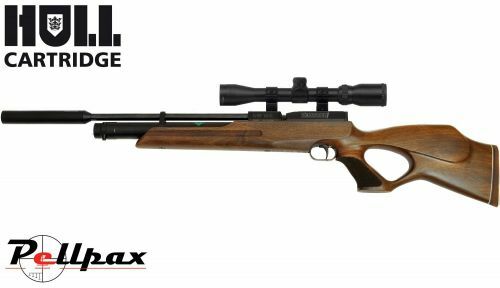 This model is also fitted with a very comfortable thumbhole stock, ideal for Field Target shooters and Hunters. As soon as your start shooting with the HW100 you will immediately be aware of the abilities of this rifle, It is one of the best rifles you will ever use. The Weihrauch HW100 are without doubt one of the quietest most accurate rifles on the market today. Packed with features to suit every shooter. The rifle comes with two 14 shot magazines, a removable quick fill air cylinder with pressure gauge, and comes with Weihrauchs superb ½inch UNF silencer. Added to this is the stunningly simple and effortless biathlon type loading system. This rifle can easily be reloaded without it having to be unshouldered. Surely a hunters delight being able to take that second shot quickly and accurately should it be required. Please Call To Check Availability.